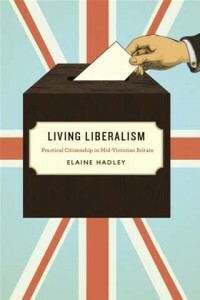 Department of English Professor and Chairperson Elaine Hadley’s Living Liberalism: Practical Citizenship in Victorian Britain has been announced as the winner of the 2011 Albion Book Prize. Awarded annually by the North American Conference on British Studies, the Albion Book Prize recognizes the best book published by a North American scholar on British studies since 1800. In the mid-Victorian era, liberalism was a practical politics: it had a party, it informed legislation, and it had adherents who identified with and expressed it as opinion. It was also the first British political movement to depend more on people than property, and on opinion rather than interest. But how would these subjects of liberal politics actually live liberalism? To answer this question, Elaine Hadley focuses on the key concept of individuation—how it is embodied in politics and daily life and how it is expressed through opinion, discussion and sincerity. These are concerns that have been absent from commentary on the liberal subject. Living Liberalism argues that the properties of liberalism—citizenship, the vote, the candidate, and reform, among others—were developed in response to a chaotic and antagonistic world. In exploring how political liberalism imagined its impact on Victorian society, Hadley reveals an entirely new and unexpected prehistory of our modern liberal politics. A major revisionist account that alters our sense of the trajectory of liberalism, Living Liberalism revises our understanding of the presumption of the liberal subject. Posted in Uncategorized. Tagged with Awards, English Language & Literature, Faculty, Victorian Britain.